Bring the LEGO Star Wars Death Star to life with over 4,000 pieces and an impressive 23 minifigures. The Death Star is the ultimate Imperial weapon. Will you control it for the forces of good or evil? Recreate iconic scenes from the Star Wars saga in the Death Star’s huge maze of chambers, hangars and control rooms. Devastate the galaxy by activating the giant superlaser in the control room to destroy entire planets. Load up and fire the turbo laser’s spring-loaded shooters to keep the rebels at bay. With 2 movable turbo laser towers and seats for the 2 Death Star Gunners, the LEGO Star Wars Death Star is ready for battle. Can Obi-Wan shut down the tractor beam in time to defeat the Empire? You decide. The detachable TIE Advanced features space for Lord Vader inside. Launch his craft from the hangar bay using the moving launch rack to help him get away, or help Princess Leia break free from the detention block and swing to safety! Storm Emperor Palpatine’s throne room and take on te Royal Guard with the included weapons. 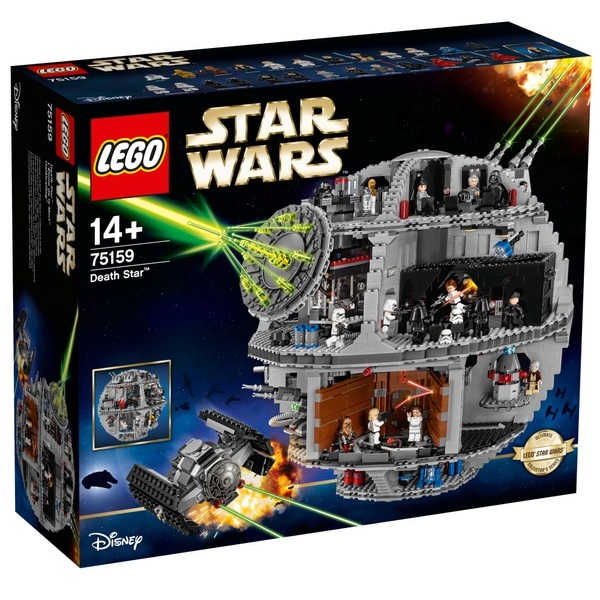 The LEGO Star Wars Death Star comes with 3 lightsabers, 4 blasters, 3 blaster pistols, 4 blaster rifles, 2 force pikes, 2 Force Lightning elements and a bowcaster. Relive Han Solo and Luke Skywalker’s adventures through the highly detailed Imperial conference chamber, Droid maintenance room, trash compactor and cargo area of this authentic model. Build and destroy the Empire’s fearsome Death Star to change the fate of a galaxy. Minifigures include Grand Moff Tarkin, Darth Vader, Emperor Palpatine, Imperial Navy Officer, Imperial Officer, 2 Stormtroopers, 2 Death Star Troopers, 2 Emperor's Royal Guards, 2 Death Star Gunners, Death Star Droid, Obi-Wan Kenobi, Chewbacca, Princess Leia, C-3PO, Han Solo, Han Solo (disguise), Luke Skywalker (Tatooine), Luke Skywalker (disguise) and Luke Skywalker (final duel), plus R2-D2, an Imperial Astromech and a Dianoga trash compactor monster.